We’re right in the middle of the holiday season and I’m being intentional to soak up every minute of it. I love, love, love December! 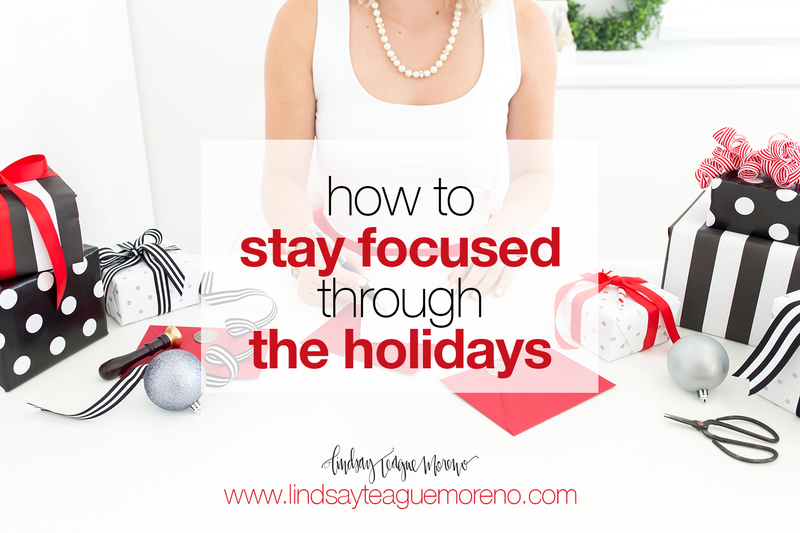 One thing I have noticed about this time of year is that focus can be low and distractions are high. There are so many things to keep up with, tons of fun activities we want to do, and for those of us in cold areas, maybe the desire to just hibernate for the whole day! I get it. There is nothing more I’d love to do than stay in bed with endless hot chocolate, watching Hallmark movies. Especially for those who sell products. Hello, Christmas shopping! I put together a few ways you can manage to keep your focus on work when the distractions are high. Get up an hour earlier. I feel you if you don’t want to hear that. It’s my least favorite thing in the world, but what if you could bang out a bunch of work in a quiet space and gain an extra hour later? Put your phone in another room, turn off your iPad, close the Facebook tab, etc. The more distractions online you can get rid of, the more productive you’ll be. Set a timer and commit to working uninterrupted for a certain period of time. The time will vary from person to person, but this helps you find your optimal work stretch before you need a break. Schedule something fun, but also schedule when you’re going to work. Have your friends over to bake cookies in the morning, but commit to working after they leave. Make a date with the kids to go look at Christmas lights, but make sure you’ve scheduled time before to get your work done. Go to bed an hour earlier. Say what? Why would I suggest you take away an hour when more time is what you need? Because a lot of us spend that last hour scrolling on our phones or watching TV. Sleep is really important and can make a difference in your productivity so if you’re wasting that time anyways, give this a try. Now hear this, I’m all for enjoying the holidays and spending time with the family. I think that is really, really important. These are really intended to help you work smarter so you have time for all the good stuff! When there’s work to be done though, you’ve got to work. I hope these tips help you get your work done more quickly so you have more time for the fun stuff! Hi Lindsay, thanks so much for posting these messages! This one applies all year long I’m guilty of wasting an hour or more, every night, in bed scrolling through FB and Instagram instead of taking better care of myself and going to sleep! It’s a new year, and I’m making changes, including being more organized with my time. Hope 2018 is wonderful for you and your family!